As any good writer knows, war, even in the overwhelming magnitude of its tragedy and triumph, must be personal. It is all well and good to describe a sprawling battlefield littered with corpses, clashing warriors, and mages slinging spells. But for readers to invest in the frenetic action that sees lives won and lost, the camera must be lowered to ground-level and placed behind the eyes of one or more protagonists with whom the reader can identify and sympathize. Paul S. Kemp's ability to do this with ease and grace marks him as one of the best fantasy authors writing today, and marks “Shadowstorm”, the second book of his Twilight War trilogy, as an adventure not to be missed. The Shadowstorm, a devastating torrent of death and nothingness orchestrated by servants of the goddess Shar, is coming to Faerun. The anticipation of the event by some characters, as well as the trepidation of others, lends a high level of tension to "Shadowstorm" that culminates in not one, not two, but several crescendos, rivaling such well-constructed build-ups as the Battle of Helm's Deep in J.R.R. Tolkien's “The Two Towers”. But even the goriest, most exciting duels would be meaningless without proper character definition. It is Kemp's careful construction of the motivations and personalities of his cast that makes each as interesting as the next. Prince Rivalen continues his manipulation of Tamlin, the young and naive ruler of Selgaunt who wishes to step out from his father's impressive shadow. Erevis Cale, the assassin Riven, and their friend “Mags” Magadon engage in a struggle not for the country of Sembia, but for Magadon's very soul. The noble and righteous warrior Abelar allows his faith to guide his feet and sword until the capture of his young son causes him to question the very core of his beliefs. Bargains with archfiends are made and political schemes continue to roll inexorably toward calamity. The pace is wound tight, and when it finally snaps, the resulting battles are appropriately riveting and hard-hitting. Slight disappointment accompanies perspective jumps from one character to another just as the former was about to engage in battle or make an exciting revelation, only to be quickly replaced by interest in the happenings of the current character. If even one character was undefined, such a strategy would be met with agitation. Rest assured that Kemp understands how to weave a strong character narrative, and that each and every page of “Shadowstorm” is worth your attention. “Shadowstorm's” only real fault is the abandonment of one particular storyline within the last 100 pages of the book, which unfortunately takes two compelling characters with it. Initially, this particular plot thread seemed hastily dropped, but closer examination reveals that this was not the case. It is not until the very end of the story that readers will realize that Kemp knew exactly what he was doing, that the thread was unwound not out of carelessness or haste, but out of a purposeful intent to take the narrative in the direction Kemp obviously had from the start. Despite the loss of two characters, “Shadowstorm” is an excellent book that does what all middle parts of a trilogy are supposed to do: chart an exciting course that leads toward the third and final installment. 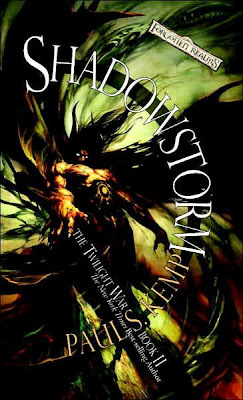 The first book, “Shadowbred”, was impressive, but “Shadowstorm” surpasses it with ease.